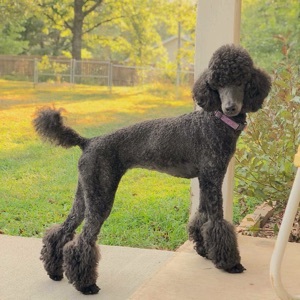 Waverly is a blue oversize medium poodle with an excellent AKC pedigree from inter-variety breeding. 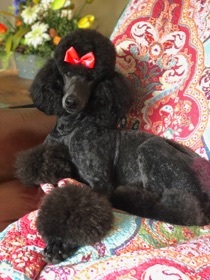 Her sire is an UKC Champion Standard Poodle, and her mother is Breezy's sister! Waverly is 19.5 inches and 25 pounds. Her personality is affectionate and sweet. 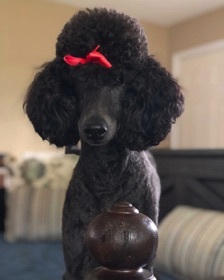 Her energy level is lower, but she is also playful and athletic. Waverly is fully health tested, including genetic diversity VGL testing. She can produce blue, silver, cream, white, sable, and possibly brindle colors.